I was fortunate enough to take a one day class called "Treasure" with Lynn Payette at last year's EAC National Seminar and this afternoon I finally finished it! I am not fond of the finishing part of projects but really had no excuse for putting this off so long. Now it is done, I have a nice little pin to wear! The pin is not oversized so can be worn comfortably on a blouse or jacket. As with all Lynn's classes, this one was a lot of fun. We constructed our pins - everyone's a little different - from scraps of metallic fabrics and threads and a few beads. Lots of "bling" so it appealed to the magpie in me. I want to take everything shiny and sparkly home to my nest! To see more from Lynn Payette, you can look online and find classes she is teaching. Check this site out to see her beautiful birches!. 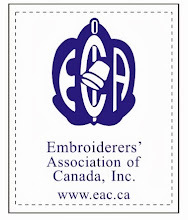 Well, passing it on is important when it comes to our stitching. 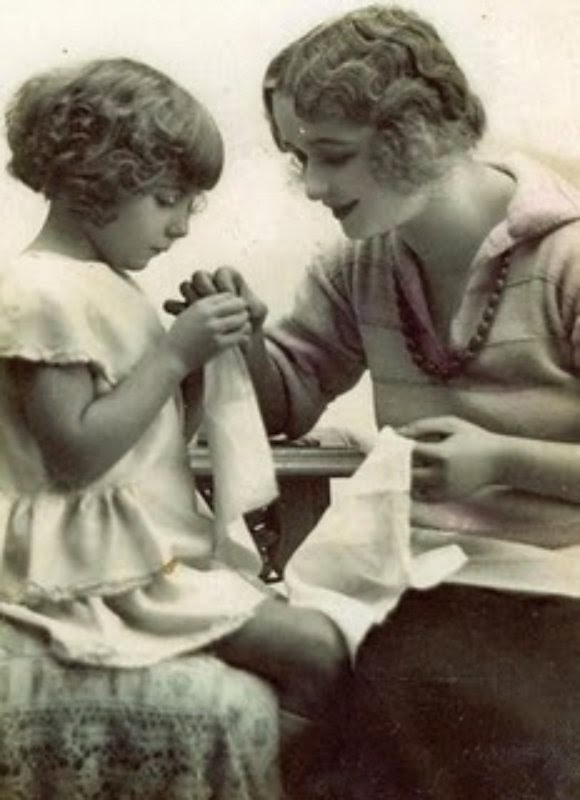 Children need the knowledge and the passion for stitching if we are going to have more embroiderers up and coming in society. So, after mulling it over for way too long, I marched myself over to the school next door and offered myself up to teach embroidery to any who are interested. I don't know yet if this will go anywhere - it will depend on if there is enough interest when they put the idea out there to the kids and their parents. But, it is a step in the right direction and I finally did it! I'll keep you posted on what develops. My goal is to get a youth embroidery group going. I found another small kit in my stash - this one for a simple canvaswork scissor fob using space dyed thread. I love variegated threads so decided it was time this one was done. It was fun quick, fun and easy project and I love the patterns that are created by the colours in the space dyed thread. 1. Stitch for 15 minutes a day - every day. Actually, I am doing very well on this one. I am stitching almost every day and usually for hours rather than minutes. Even my husband has noticed how much I am stitching so you know it is a lot! I fell down on this hopelessly in the last year and as a result only a couple of diehard followers are still reading my blog - thank you both of you! lol I can say I am blogging more regularly, although not as often as before, and I wonder if any of it is interesting to anyone but me. 3. One show or Exhibition this year! Doesn't have to be big (it won`t be) but something to get me out there at least locally. It doesn't have to be crazy quilting either - just some sort of art or craft. I am dabbling now with other things which is fun and helps to get all the stash under control. I am on track here too. I am booked into the County of Vulcan in April to be the Artist of the Month and will be yarn-bombing their offices. It might not be quite what they expect but should be good fun! 4. Write at least two articles and submit them for publication. It`s another way to get yourself out there and the research is good discipline. Lord knows I need discipline! lol Once again, I don't necessarily expect to get two pieces published, but I would like to at least write them and submit then - that is the goal. I am on track with this one - I have submitted one article already and the year is still young. 5. Start taking EAC correspondence courses with the goal of getting my Teacher`s Certification from EAC. This will be a long, drawn out process - there are quite a few courses needed but this year I will actually start. 6. On a similar note, I would like to get back into teaching stitching which means getting some teaching proposals organized and getting them submitted in time for fall deadlines. Nothing accomplished on this one yet but will get on it now I have reminded myself here. 7. This year I am going to aim at entering at least two competitions with my stitching. I am actually working on a piece right now for the EAC Beaded Jewellry Challenge so if I get it done in time I will get it sent off and this is halfway done. 8. One item made and donated to charity each month. I am way behind - nothing this year yet! AAQI closing has thrown me and I don't know what to make or who to give it to. Just need to buckle down I guess. 9. 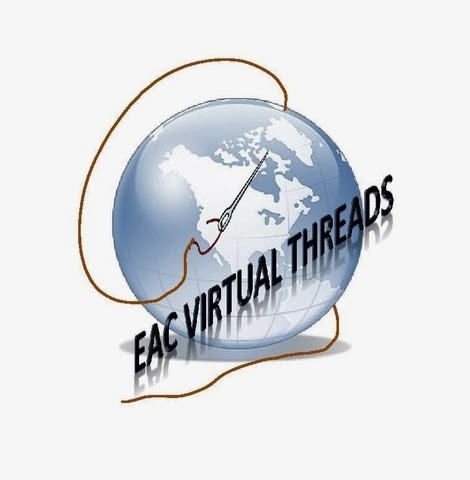 Continue involvement with The Embroiderers' Association of Canada (EAC), the new EAC Virtual Threads cyber chapter and The Calgary Guild of Needle & Fibre Arts. Going gangbusters at this! lol I am happy to report the cyber chapter is off to a great start, and I expect to continue on with my commitments to the other organizations for the time being. 10. Organize the sewing room. Okay, so that is where I stand as far as progress on this year's goals. How are yours going? My darling daughter saw some very cute embroidered initial pendants on Etsy and asked me if I could make her a couple. K is for Katie and V is for Vegan. This is very short notice since her birthday is in three days so I wasn't able to find the frames I wanted but these steampunk style ones should work. If not, I'll order the right ones and have these back! It only took about an hour to make them including putting them together so it is a very nice easy project. Hope she likes them! Enough with the ATCs Already! I have had to call a halt to my obsession with making ATCs for the time being. These are the last ones I have made for this year`s EAC ATC Exchange, bringing the total to 35+. This first group were the result of playing with colours and a bargello pattern from an old issue of Embroidery Canada. I am new to canvaswork so make allowances! lol As always, though, ATCs are a great way to explore a new technique or colour scheme and see where it takes you. This last grouping is the result of once again upcycling a piece of cross stitch gleaned from my local thrift store. Almost finished and then abandoned, it deserved better than to languish on the thrift store shelves so it came home with me to be put to another use. I use leftover threads for these projects, letting them inspire me as they see fit so you will notice that the buttonhole stitch around the edge of the cards changes colour at whim. Artist trading cards (or ATCs) are miniature works of art about the same size as modern trading cards baseball cards, or 2 1⁄2 by 3 1⁄2 inches (64 mm × 89 mm), small enough to fit inside standard card-collector pockets, sleeves or sheets. The ATC movement developed out of the mail art movement and has its origins in Switzerland. Cards are produced in various media, including dry media (pencils, pens, markers, etc. ), wet media (watercolor, acrylic paints, etc. ), paper media (in the form of collage, papercuts, found objects, etc.) or even metals or fiber. The cards are usually traded or exchanged. When sold, they are usually referred to as art card editions and originals (ACEOs). Now, I am swearing off making ATCs for awhile so I can get something else done! I will get all of these mailed off now so that I can`t be tempted to make "just a couple more"! DD is coming home from university this weekend for her birthday so I need to finish up some stitching she has requested - more on that tomorrow! Since I finished up the stitching I don't look at them as cheating! lol I also found a piece of brazilliam embroidery in a nasty little plastic frame and cut it down into an ATC as well. I think this bit of embroidery will be much happier as an ATC than it was in that nasty frame. In order to use pieces of embroidery for ATCs, I first iron double faced adhesive to the back. Then I cut them out to the desired size - the adhesive holds the stitching threads secure so they don't unravel. I peel off the paper on the other side of the adhesive and iron them onto pieces of wool felt which serves as their backing. I finish them up by blanket stitching around the edges by hand. Voila! Now they are finished I hope I will be able to get this song out of my head! I missed the class Jennie Wolter taught Calgary Guild of Needle & Fibre Arts recently called "Waste Not, Want Not Ornament", designed to use up leftover bits and pieces while teaching various stitches and a finishing technique.. Although I missed the class, I was fortunate enough to receive one of the class kits and this is the result. The colours would not have been my first choice but now it is done I rather like it. I got practice at various canvas stitches: rhodes, crescent, blanket, satin, tent, jessica, smyrna, satin, tent, norwich and square cushion, some of which were new to me. It was a fun little project and I will make some more of these if time allows. Thanks Jennie!